Since its begining in 2003, the Global Campaign for Education has recognized Global Action Week for Education (GAWE) as a focal point of the Education For All movement. The week provides national and regional campaigns with the opportunity to highlight an area of their education advocacy agenda and to make targeted efforts to achieve valuable change on the ground. With the support of millions of members of the public and education champions worldwide, the Global Action Week for Education 2019 (April 24th - May 1st) aims to strenghten civil society participation, mobilize global education funding, and inform a strong, multilateral commitment to a human-rights. Since 2015, GAWE has emphasized active participation to achieve all targets of United Nations (UN) Sustainable Development Goal 4 by the year 2030. This year, students starting school in 2019 will complete their 12 years of basic education by 2030, making this an ideal moment to mobilize. My Education, My Right(s): Making the right to an inclusive, equitable, quality, free public education a reality. The aim of Global Action Week for Education 2019 is to merge global and local connections through interpersonal experiences. By wielding the power of story-telling as a tool to create a network of narratives, the Global Campaign for Education movement strengthens its commitment to human rights. “My Education, My Right(s)” is a call to action rising up from the voices of individuals, and disseminating across a united front. The focus on personal stories empowers advocates at all levels of activism to engage with a range of issues barring access to quality education globally. Today, one of the most pressing issues facing univeral accessibility is displacement and the fate of students in regions of conflict and crisis. 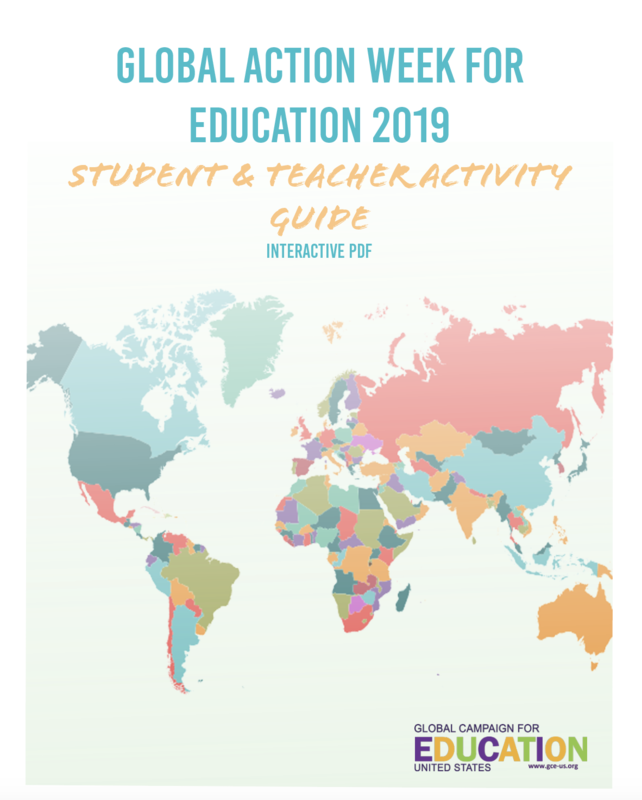 The following Student and Teacher Activity Packet allows students to share their education stories, to discover the impact of emergencies on access to quality education, and to learn to be an advocate for global education funding.